The loss of the lumber schooner Thomas Hume on May 21 1890 was a mystery for over 100 years. The ship was owned by the Hackley lumber company of Muskegon, Michigan, and used to transport lumber to Chicago. White pine logs cut in winter from the forests of Michigan would be floated down the Muskegon River during the spring flooding and cut into boards at a saw mill near Lake Michigan. The Hume, named after Charles Hackley’s busness partner, was returning from Chicago empty when the ship and 6 crew members sailed into a storm and just disappeared. 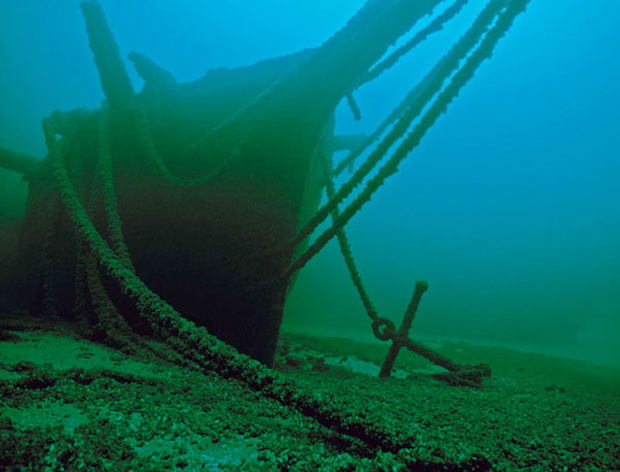 No trace of it was found until the 1990s when A & T Recovery of Chicago discovered an intact schooner on the bottom of Lake Michigan. 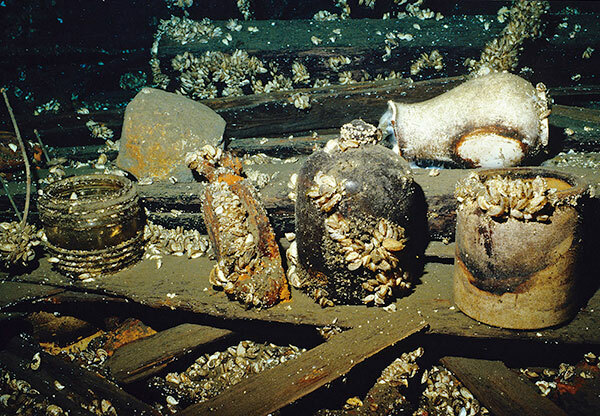 A trio of divers from Chicago explored the wreck for a few years, and while it was strongly felt that the wreck was the Hume, nothing was found to positively identify the wreck. 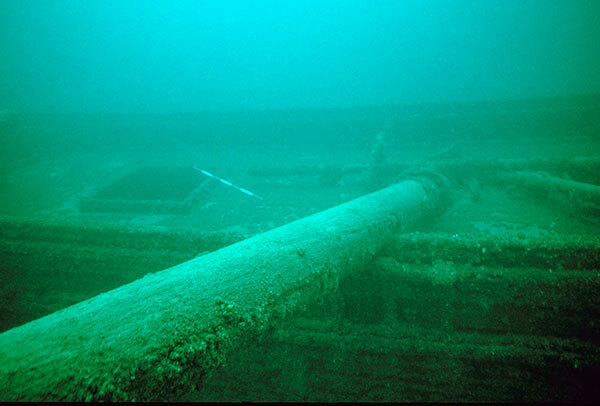 In 2009, the Chicago divers approached the Michigan Shipwreck Research Association and formed a partnership to survey the wreck and create a museum exhibit on the property of the Hackley home in Muskegon. 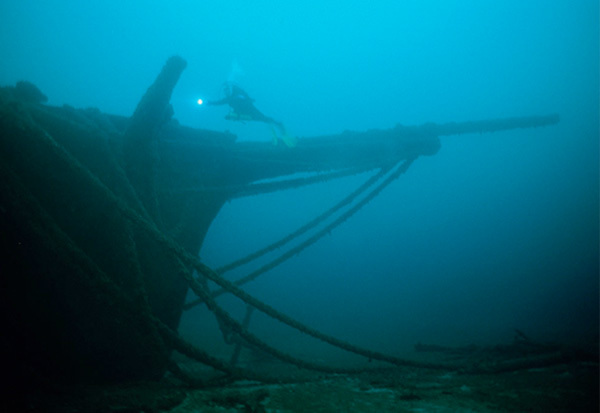 We would spend the summer of 2010 diving out of New Buffalo, Michigan, surveying and photographing this intact shipwreck in the middle of Lake Michigan. 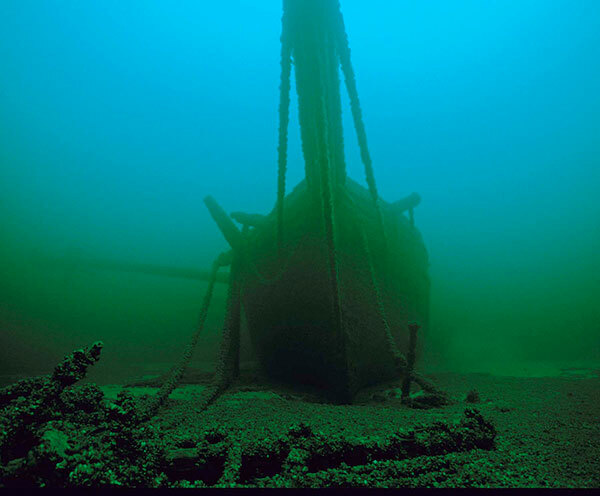 A normal day of diving would involve pulling the boats two hours south, launching near the bottom of Lake Michigan, then over an hour of running west into the lake where we would meet the divers coming over from Illinois. On clear day you could see the Michigan shore, Gary, Indiana, and the Chicago skyline. While the wreck lies in the middle of the lake, it’s far enough south to be relatively shallow: less than 200 feet. 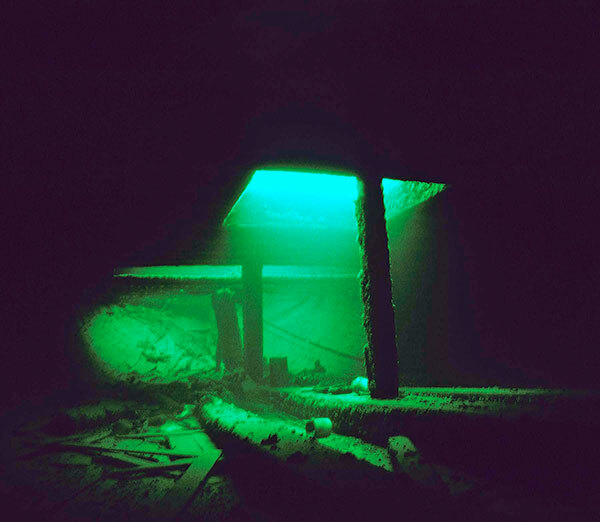 There was plenty of ambient light, and by late summer the water was warmer than the usual 38 degrees on the bottom. On the first dive, I discovered that this schooner was like no other Great Lakes sailing vessel I had ever seen. The bow was really different: much more graceful. This led me to an old book by James P. Barry: “Ships of the Great Lakes”. On page 66 the author describes a “clipper schooner” designed by William Bates of Manitowoc, Wisconsin. The clipper schooners were two-masted vessels with a shallow spoon shaped bow. Designed to carry lumber, they had boxy sides, a flat bottom, shoal centerboard, and two false keels between the centerboard and the turn of the bilge. The Hume was built in Manitowoc in 1870 where it was listed on enrollment as having two masts. The wreck we were diving matched this description in every way except one: it had three masts. Sometime in the summer of 1890 a bottle washed ashore with a note. The writing was faded, but the person writing it said they were on the Thomas Hume sailing the Chicago to New Buffalo route and the ship would not hold out much longer. At the time it was considered a hoax, as the Hume would be on the route to Muskegon. Today they Hume lies on the bottom almost exactly between Chicago and New Buffalo. Jan hovers above the bow. Anchor chain is running to the anchors spilled on the lake floor in front of the wreck. The tip of the aft mast rests on the bottom. 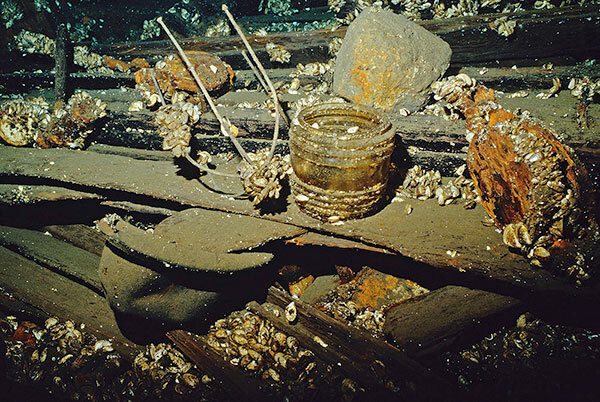 Artifacts under the area where the aft cabin was: a lantern glass and hat. Another assortment of artifacts in the cabin area. All three masts are lying to starboard. It would appear that the ship went on its side then sank. 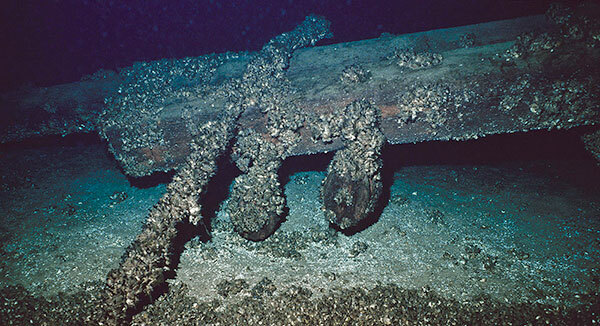 Anchors and chain buried in the bottom in front of the bow. Looking aft from the starboard side of the center board trunk. The false keel can be seen turning in towards the main keel. This extra keel helped identify this as a clipper schooner.